Movistar Yamaha Teammates Jorge Lorenzo and Valentino Rossi made their intentions clear whilst testing their YZR-M1s today at the Sepang International Circuit during the first Official MotoGP Test of the year, taking first and second place respectively. Lorenzo arrived at the sunny and hot Malaysian circuit feeling slightly under the weather, but his mood changed as soon as he put his visor down and swung his leg over the new YZR-M1. He needed little time to move up to fifth place at the end of the first hour, before his smooth riding style took him to first position in the standings, which he held until the end of the session. With his pace proven to be as fast as ever, the Spaniard then decided it was time to test various options for the setting of his bike and ended the day 1.033s ahead of the rest of the field with a fastest lap of 2’00.684s. Teammate Rossi was also eager to break in his new YZR-M1 and make clear he means business. He needed less than an hour to take over at the top of the provisional ranking order and with the muscles fully warmed he went on to focus on testing two different set-ups for his bike. Despite a short break when the session was red flagged due to a crash of Eugene Laverty, the nine-time World Champion was able to tick off most items listed on today’s testing schedule. He spent more time on track than any other rider, completing a total of 55 laps, and finished with a solid fastest lap of 2’01.717s for second place. 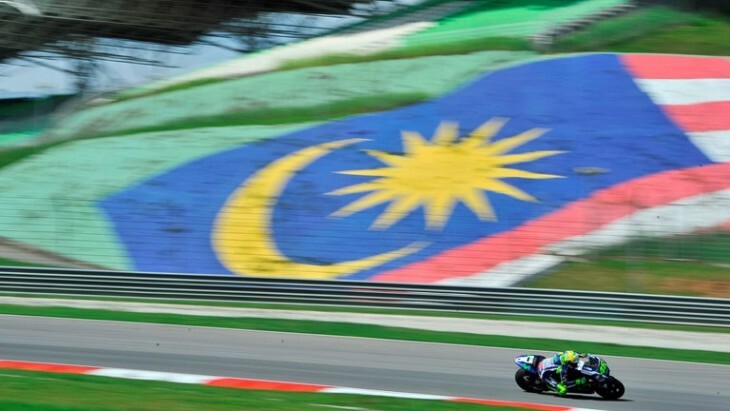 Monster Yamaha Tech3 duo Pol Espargaro and Bradley Smith were back on board their Yamaha YZR-M1’s today at the first day of action in Malaysia as they rode their first laps of the year after the winter break which lasted for two months. Both riders eagerly began working on setting up this year’s Yamaha MotoGP bike together with the new electronics package and the Michelin tyres, with the opening findings being positive. Pol Espargaro leapt straight into gear as soon as the opening shakedown began and he embarked on his testing programme, before setting a personal best of 2’02.646 on his 27th lap. Meanwhile, Bradley Smith finished the day three places behind his teammate, after tirelessly completing 55 laps as he collected vital information for the upcoming season. The hard work will continue tomorrow with both riders fully confident of making further steps forward and lowering their lap times.